In February I wrote a post about my intention to create a craftivist project on the minimum wage. Glad to say I have followed through. Making this a school project certainly motivated me, but now I feel I’m onto something–I don’t think it will be just a one-off. A good thing about the Textile Design course I was taking at UBC is that every project required an artist statement. I found this helped me work through my thoughts about my intentions. Here is Betsy Greer’s definition of craftivism. Here is the finished work, followed by the artist statement I wrote for the project. Installed at North Grandview Highway (not actually a highway) off Commercial Drive–Vancouver. One of a series. 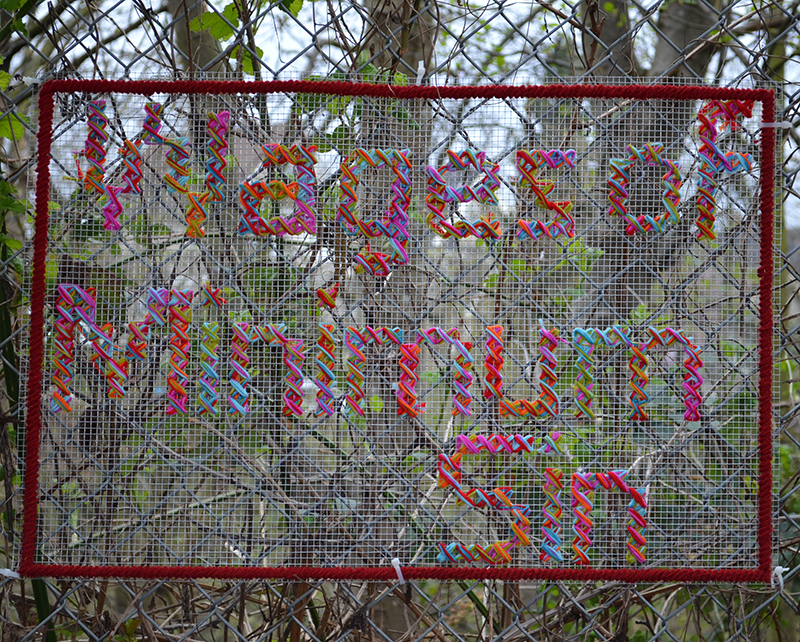 The materials used in this piece consist of a fencing mesh and multi-colored acrylic yarn cross-stitched to make up the text “Wages of Minimum Sin.” The border uses wool yarn embroidered using the tent stitch. The work measures 21.25 x 31.5 inches. This project was inspired by the craftivist work I encountered during my research for my class presentation on craftivism. Like many craftivists out there, I have wanted to contribute my voice on many of today’s issues but (like them) participating in a protest hasn’t felt right. Craftivism offers an alternative way of contributing your voice to issues you care about. When you decide to take action, you increase your involvement in an issue with mind and body. The mere act of working on the project propels you into further thought on the issue. I like that with craftivism, you don’t have to be in people’s face. The issue I wanted to address with my piece centers around the ethics of minimum wage. I struggled personally with this issue while looking for work in the past 2 years. I also had many conversations with a friend who was in the same situation. We are both educated, smart, and responsible, yet we are expected to use our qualifications and take on great responsibilities at $10.25 an hour—the current minimum wage in B.C. I knew what my topic for the piece was and that I wanted to work with text, so cross-stitch felt appropriate—but minimum wage is a big topic. I typically mull things over by discussing the issue with a few friends and by researching the topic online. I searched with the keywords ‘minimum wage’ which resulted in articles by editorial columnists and economists. But later (with more discussion) I became aware of different ways of approaching the discussion. For example, while I was thinking that I wanted to make something that touched on minimum wage, a friend suggested I frame the discussion around the living wage. This sent me doing some more research and reading articles by The Canadian Centre for Alternative Policy (CCPA—The CCPA is an independent, non-partisan research institute concerned with issues of social and economic justice). Consequently my knowledge of the issue evolved significantly while working on this project and I started asking myself new questions. During this process I realized that the complexity of the issue could not be properly addressed with one piece. So I have come to think of this as a series for which I am presenting the first piece. Since this is a craftivist project, it is important that it have an audience. 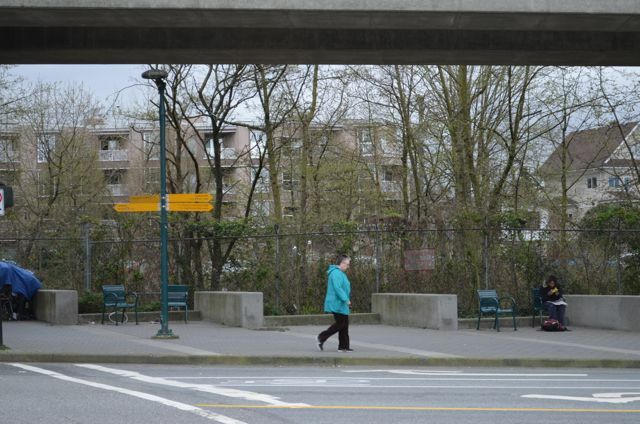 With this in mind, it will be installed on a public fence at North Grandview Highway near Commercial Drive—a corner with lots of walk-by traffic. My intention with this work is to get people to think about the minimum wage and how it effects them or people they come into contact with throughout the day. The phrase “Wages of Minimum Sin” is a play on a biblical reference yet there is no religious message intended in the work. In the King James version of the Bible the original reference goes: For the wages of sin is death; but the gift of God is eternal life through Jesus Christ our Lord. The biblical reference simply provided an interesting way of making a statement on minimum wage. With these words and the techniques and medium employed, I hope to create visual appeal and that people will be drawn to look closer and think further. Project in context – homeless people often sit at those chairs for a rest. You can just barely make out the piece (in front of the woman in the turquoise jacket). I like that it blends in with the surroundings, thus making it subtle and hopefully drawing you in as you notice it. bravo! i’m currently struggling with getting back into paid work too. for all my education, degree, etc. i’m faced with unpaid internships as a way of making progress and a lack of replies to applications. it’s difficult to stay motivated and i don’t think working for free or even making minimum wage is much of an incentive these days. I got lucky 3 weeks ago and found a part-time job (that’s what I was looking for) at a decent wage. It is completely unrelated to my field but right now it serves purely a financial purpose. I think the only reason why I had a shot at this job is because it was only posted in two places — Kwanthlen college and the UBC student career website. I have access to the UBC student site since I’m currently a student there. But otherwise I had stopped looking at and applying for jobs on craigslist. So many people look there that employers are inundated with resumes. I’m also volunteering right now as a classroom assistant for the Richmond Art Gallery’s School Art Program thinking this will help when I finish the Diploma. There’s arts related jobs on the Alliance for the Arts website but I am so disappointed to see that so many pay $11p/h. I do agree with you, it is hard to be motivated to apply for but also stick with a job that only pays minimum wage. You’re always looking for something better. It’s a bad situation for everybody involved.